Indie group Bad Books, made up of solo artist Kevin Devine and the mem­bers of Atlanta band Man­ches­ter Orches­tra, released their first album on Tues­day after form­ing ear­li­er this year. The band com­bines the styles of its two sources of tal­ent well, cre­at­ing an ambi­ent-edged indie folk that is simul­ta­ne­ous­ly rich and ele­gant. 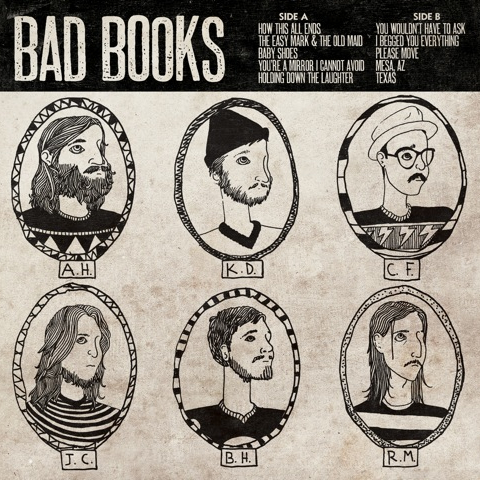 The self-titled Bad Books is a sol­id album, and an impres­sive debut for the group. Bad Books uses an impres­sive range of instru­men­tal sounds, from the slow, con­tin­u­ous line under “How This All Ends” to the loud­er, gui­tar- and bass- heavy sur­round­ings of “Please Move,” to cre­ate the vari­ety of musi­cal approach­es they intro­duce on their debut. It’s occa­sion­al­ly near-jar­ring when the band switch­es so dras­ti­cal­ly between sounds - but Bad Books is good enough at each of the styles, and each track comes so quick­ly into its own that it’s nev­er a prob­lem. As such, Bad Books alter­nate­ly invokes folk, indie, and rock with equal skill, cre­at­ing a var­ied and yet cohe­sive sound. Kevin Devine is the very essence of a arche­typ­al folk vocal­ist, and it shows. His voice is not, how­ev­er, gener­ic. Instead, Devine does folk well, imbu­ing the slight­ly scratchy, plain­tive sound of his voice with emo­tion. That emo­tion gen­er­al­ly comes off best when in the melan­choly range - Devine may be a decent vocal­ist, but his suc­cess­ful emo­tion­al range isn’t much wider than the (admit­ted­ly small) aver­age range for his genre - but when it does work, which is quite often across Bad Books, it meets the music in such a way as to make every­thing work. Lyri­cal­ly, Bad Books is noth­ing short of excel­lent. Devine proves him­self an excel­lent writer just about every­where on the album. Take, for exam­ple, “Baby Shoes,” which para­phras­es the famous 6-word Hem­ing­way sto­ry: “For sale: baby shoes, nev­er worn,” work­ing from there into a beau­ti­ful­ly bit­ter track which Devine orches­trates per­fect­ly. Then there’s “You’re a Mir­ror I Can­not Avoid,” one of the most ver­bal­ly rich tracks on Bad Books, where Devine strings togeth­er such unortho­dox but odd­ly insight­ful metaphors as “You’re a mir­ror I can­not avoid / Strung out and jit­tery and para­noid / A leaky bat­tery that can’t keep charged.” As a whole, Bad Books lyrics are just great - a lov­ing­ly assem­bled group of sto­ries behind Man­ches­ter Orchestra’s musi­cal stylings. Bad Books isn’t with­out flaws - but giv­en how small those flaws are, and giv­en that this is a debut album for the group, it’s pret­ty impres­sive. The band has done a com­mend­able job apply­ing their con­sid­er­able musi­cal expe­ri­ence to Bad Books’ mix of tracks, cre­at­ing an album that is, as a whole, both inter­est­ing and sim­ply enjoy­able to lis­ten to. Vocals, instru­ments, and extreme­ly well-writ­ten sto­ries come togeth­er to cre­ate an album that leaves us excit­ed for Bad Books’ next step, what­ev­er that may be.